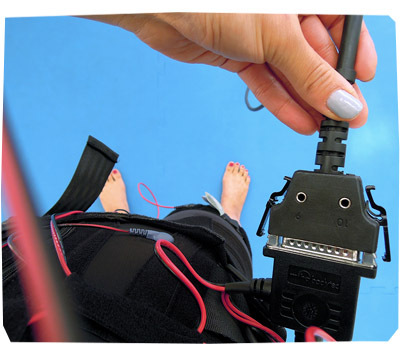 I do some pretty cool/strange things for my blog… and for my latest adventure, I electrocuted my muscles to tone them up! These two photos were taken one day apart, before and after my session at SpeedFit, in Northbridge. Eeep, my biceps have never been so full and perky before. So let me give you the back story. I have been very fit and active for the last 3 – 4 years. I run, cycle, play netball, do yoga, boxing, weights, cross training and more. 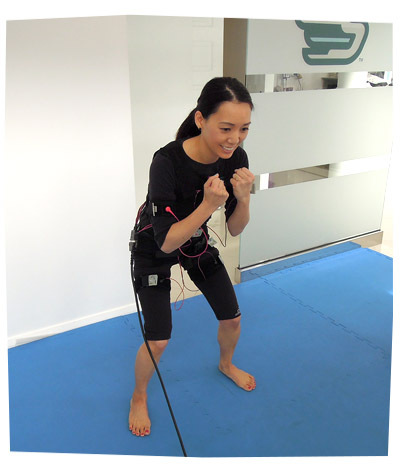 I first tried EMS (Electronic Muscle Stimulation) in Singapore last year. Initially, I did NOT like the idea at all. I thought it was cheating, unnecessary and against my idea of what it means to be “an active and healthy person”. However, once I tried it, I actually thought it was pretty good (and weird)! The fact is… it worked. My muscles became very toned, very quickly. Ordinarily I work very hard to keep the weight off, so most of my exercises are for me to tone up, strengthen my core, improve my posture and flexibility, keep my body healthy, strong and injury free. I also exercise because it’s fun, it makes me feel good, it challenges my mind and it helps me sleep better. I don’t focus on body sculpting or maintaining rock hard abs. So I could see how EMS training could complement my active lifestyle. Having toned muscles would be like icing on the cake for me! I’ve been told that EMS Training is huge in Asia and Europe. 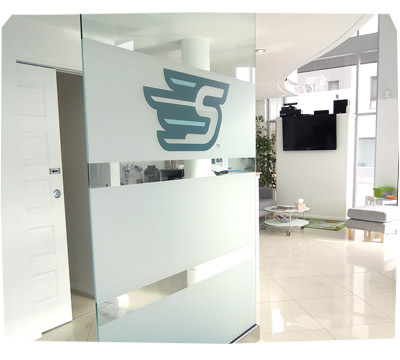 Apparently it is a thriving and popular industry; studios are as common as regular gyms and no one thinks twice when you mention you’re off to the local EMS studio. So when SpeedFit EMS Personal Training contacted me, it turned out that they were the first to bring the concept to Australia (several years ago), and I was keen to work with them to spread the news. SpeedFit launched in Perth 2 years ago and now have more than 700 clients. They have 2 studios, one in Northbridge and one in Claremont. I turned up early on a Tuesday morning for my 10:30am session. It was a cold, windy day. I was dressed in a white shirt, grey knit, grey coat, black jeans, thick socks and boots. My motivation to exercise was er… 2/10. I thought that the studio would be quiet and empty at that time, but there were two women doing their workout session ahead of my time slot and one other woman in the waiting area, who was going to do her session at the same time as me. I had a little chat to her and she told me that she had been doing EMS Training for 4 months and absolutely loved it. She said she hated going to the gym, she has two kids under 4 years old and this was her only form of workout. The two women finished their session and raved about their workout. They had a beaming post-workout glow as they walked out the door. After seeing and chatting to the other women, I was pretty excited to get started and my motivation to exercise rose to 7/10. 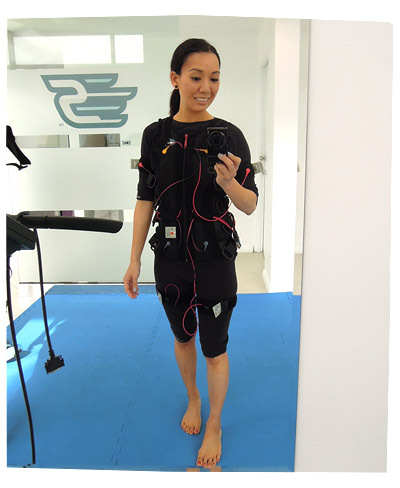 EMS involves putting on a suit that delivers electronic impulses to your major muscle groups to make them contract. A personal trainer leads you through a customised workout and apparently a 20 minute session is equivalent to 4 hours at the gym! I went into the private change rooms, took off all my clothes, stored my watch and jewellery safely in a locker… and then I put on the supplied cotton top and 3/4 leggings. I have to wear this cotton outfit because there has to be a thin, single layer of fabric between the electrodes and my skin. Plus I’m going to sweat like crazy so I’ll be able to discard them in a laundry bag for someone else to wash. It’s all part of the service. Yay. The instructor sprayed the EMS suit with water and fastened it onto me. She also strapped on little belts and wires on my biceps (arms), quads (legs), glutes (bum). I felt like I was wearing a soggy corset! My instructor plugged me into the EMS machine and I suddenly felt like a bubble jet printer. This is the EMS machine. Looks like a cute, harmless robot! 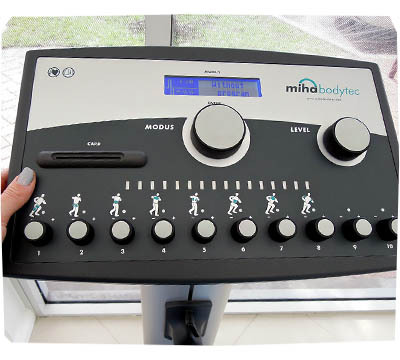 Each little knob adjusts the strength of impulses to each muscle group. And the big knob on the right controls the overall impulse levels to all muscles. The instructor customised the machine, tweaking the impulses to suit my comfort level. It feels like little massage balls bumping on my skin. It’s not painful at all. It doesn’t feel zappy, or pinchy or twingey on my nerves. It feels a bit weird and kind of nice, when set to lower levels. But what’s the point of a low-level massage right? I wanted to tone up my muscles and get a workout! This is me about to start! 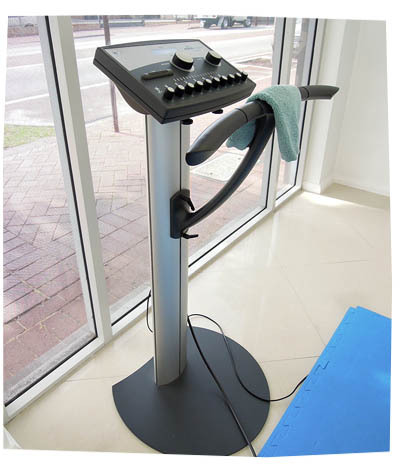 Once the machine began the program, it led me through a 20 minute workout session. The impulses went for 6 seconds and stopped for 4 seconds. I had to tense my muscles, HOLD for 6 seconds, then I got a 4 second break to change positions. It’s a bit like yoga, in that I had to concentrate on the position of my body, arms, legs and back. The instructor went through different workout positions, like squats, rear leg extensions, calf raises, bicep curls and more. It was pretty simple. As the workout went on, I realised that I could handle a higher level of impulses, so I just reached out and changed the levels to my liking. The instructor also started to push me a bit and upped the levels for me bit by bit. By the end, the impulses were quite intense. I wanted to go hard! I was puffing and sweating as I finished. The whole thing went for 20 minutes. So quick! Immediately after the workout, I was able to have a shower in the private change rooms, blow dry my hair, change into my clothes. My instructor made me a protein shake to help with my muscle recovery. I was in and out in 45 minutes. (I probably could have been in and out in less time, but I stopped to chat to my instructor and asked her a lot of questions). I stepped out of the studio looking as fresh as a daisy. I caught up with my friend for lunch and she could not believe that I just “had a workout at the gym”. I was glowing with a fabulous post-workout feeling! I felt amazing! That evening, my biceps ached a bit and I knew I had worked them quite hard. I took a photo of myself in the mirror (at the top of the post) and was very impressed to see that my biceps were significantly rounder and fuller than before. I have been lifting 5kg to 7.5kg dumbells and working out my arms (twice a week, for the last few months), but I’ve had to slow down because my elbow/forearm hurt a bit and I didn’t want tear anything. So this was a great way to compliment my weights workout and give my arms a boost. I’m really happy with the results. There’s lots of information on the website about the Benefits of EMS and a list of Frequently Asked Questions. SpeedFit suggest that you do training once a week, and they have created several membership packages to suit different lifestyles. See their Price List here. 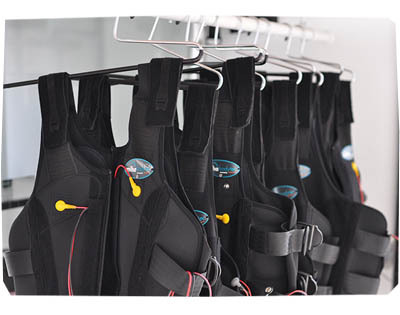 So here’s the big plug – SpeedFit have a special offer at the moment: TWO trial sessions for $90! (The standard rate for one session is $90). This is a pretty cool offer, especially if you – like I was – a bit unsure whether it’ll work for you, and just want to give it a go. It was Mother’s Day yesterday… and my husband and kids asked me what I wanted as my Mother’s Day Treat. So after a morning of pancakes and presents, my wonderful husband took all three kids to the city for the day, just so I could have my run. Yay! 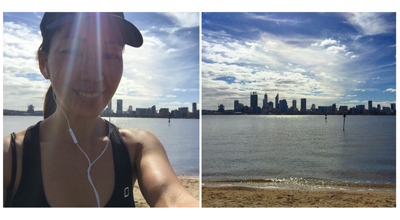 I ran around the Swan River, around the 3 Perth Bridges (The Narrows Bridge, the Causeway and the Graham Farmer Freeway). I think I ran 12km (at a 6:30min/k pace) and walked 3kms, totalling a distance of 15km. I was pretty happy with that. I felt great after. A bit sore and tired though. I haven’t had a big run in aaaages. The last time I ran 12kms was two months ago. Since then I’ve been doing short 2 – 6 km runs here and there. Then I picked up swimming. Then work got busy. Then I went on holiday. It’s been so nice to get back into the fitness groove again!